Last night I fought my second battle for the Tale of Four Gamers. Unfortunately, only two of the four were able to make it. My opponent was Chuck and here is most of his army. He is working on a Master of the Forge Space Marine army and he plans to have lots of Dreadnoughts. It is a cool army. Here is most of my army. I wish I could remember more of the battle so I could write a battle report, but unfortunately I cannot remember enough details. I will need to remember to write things down during a battle so that I can write one. Anyway, here are some picture from the battle. I took a lot of pictures, but only a few turned out well. Some of the highlights of the battle include my Great Unclean One destroying the ironclad with a lucky roll of a six on one penetrating hit, and also killed the Master of the Forge. 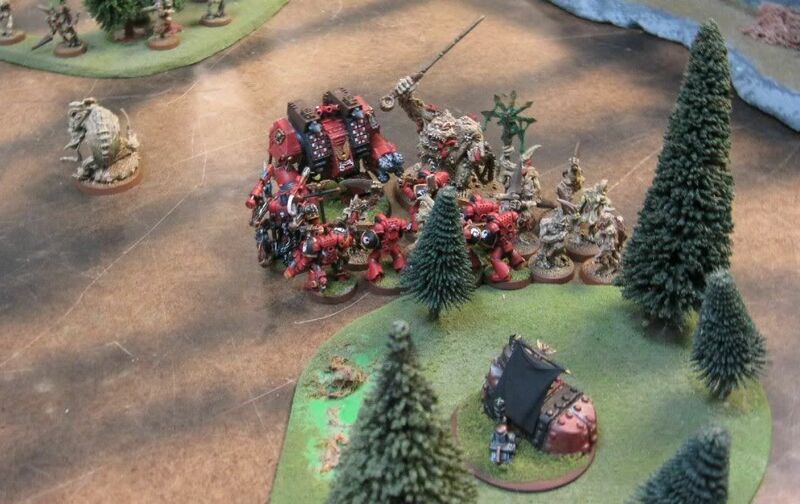 The soul grinder killed one whole tactical squad and a drop pod on his own (the drop pod was blocking his movement). 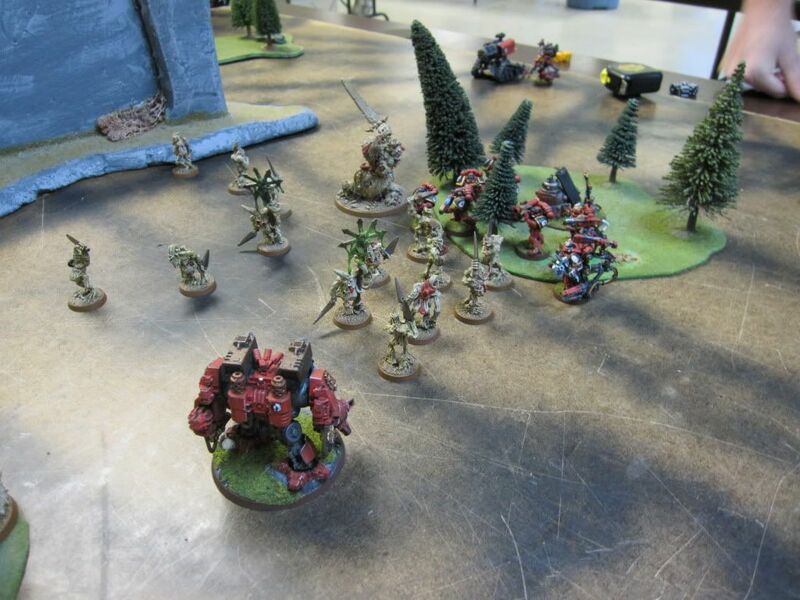 It was a fun battle with my daemons getting the win by annihilating all the marines except the Thunderfire cannon. After a few battles with my Nurgle daemons, I have realized that they really excel at the smaller point battles than larger battles. It would seem that in smaller battles, losing models is more significant. The invulnerable saves with the feel no pain allows them to hang around longer than the opponents and gives them an advantage. I have taken a break from working on my army and I have been working on some terrain themed to my army. My first piece is a dead forest made from some old Armorcast trees that I had. I think it turned out pretty good. I am currently working on a few other pieces, but I will wait until they are finished before posting pictures. Among them are an Arcane Ruins, Blastscape, and a crashed lander from the Battle of McCragge set. I also plan to do a Temple of Skulls once my order for it comes in at my local hobby store. As of today, here is everything I have completed for my army. I am really proud of my Soul Grinder. 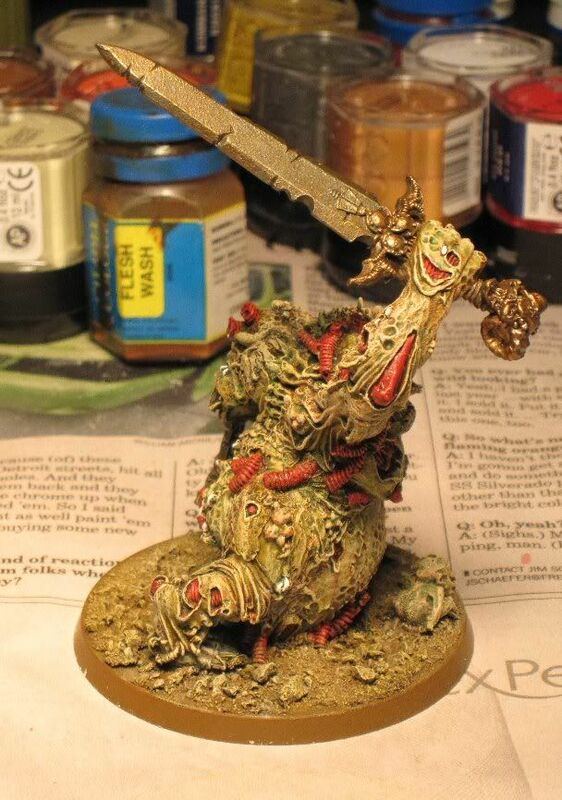 I wanted a nurgle version that looked unique, and I also wanted it to look like a giant plaguebearer. 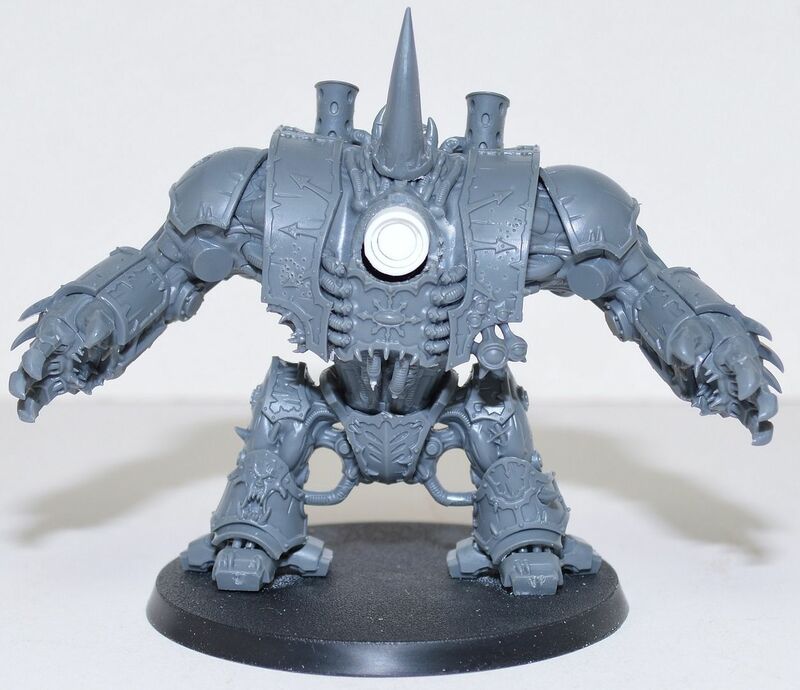 Here are some more pictures of the soul grinder. I used green stuff to sculpt his head, belly, and pustules. I think he turned out nice. He has drawn a few gawkers during the games I have played with him. Here are the three army themed objectives I did for the ToFGs. I am going for a death motif with my army. 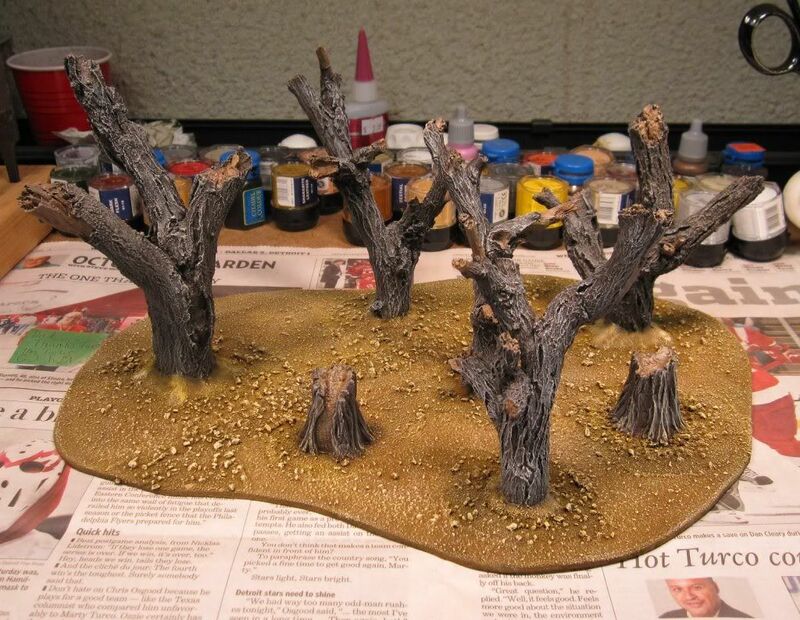 I am currently working on some death world terrain, including some dead woods pieces. I hope to have them painted by the end of the weekend. 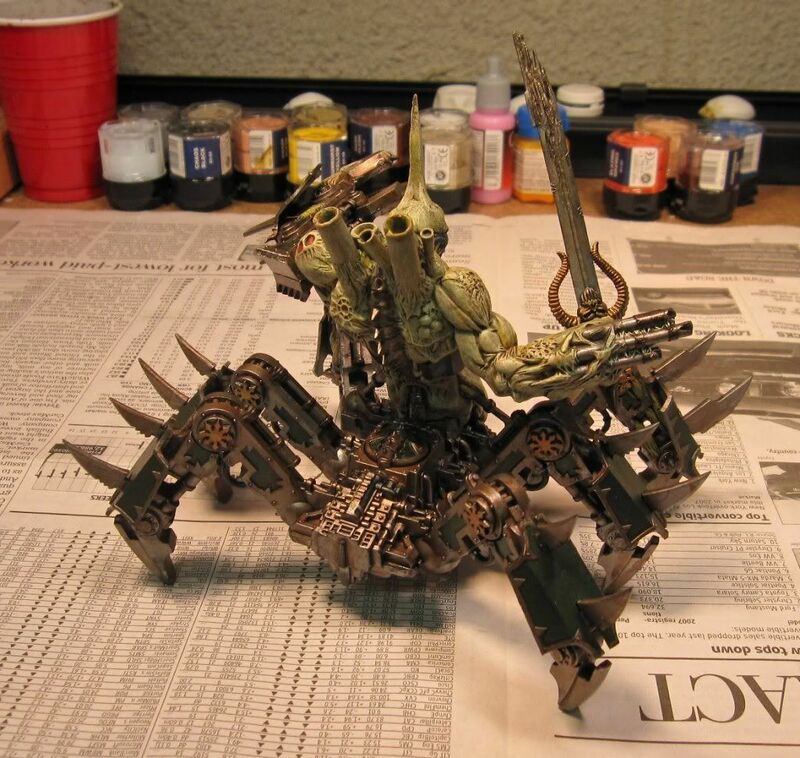 I have been working on a 40k Nurgle Daemon army over the past month or so, so I decided to start a blog for it. I started the army because I joined a Tale of Four Gamers contest over at 40kFightClub.com that is being held by my local 40KFC chapter, the Ordo Fraternitas. 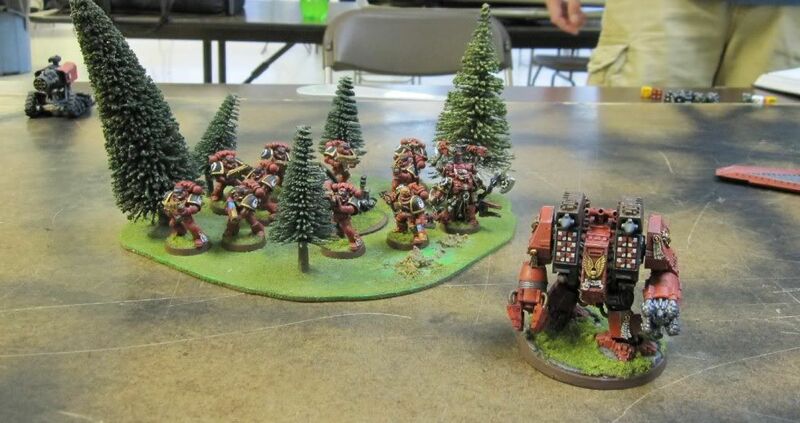 Two of the other members are doing Space Marines and Blood Angels, I am not sure what the fourth guy is doing as he did not show up for the first battle. 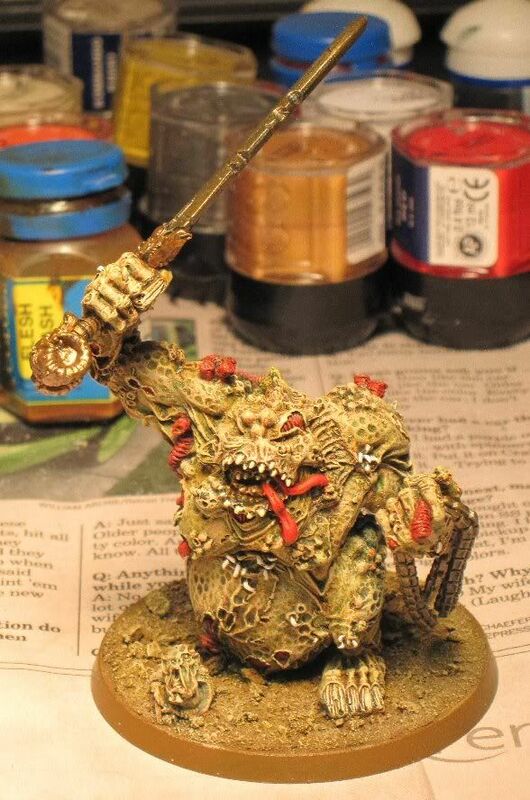 My first 500 points consisted of a Great Unclean One and two units of 10 Plaguebearers. 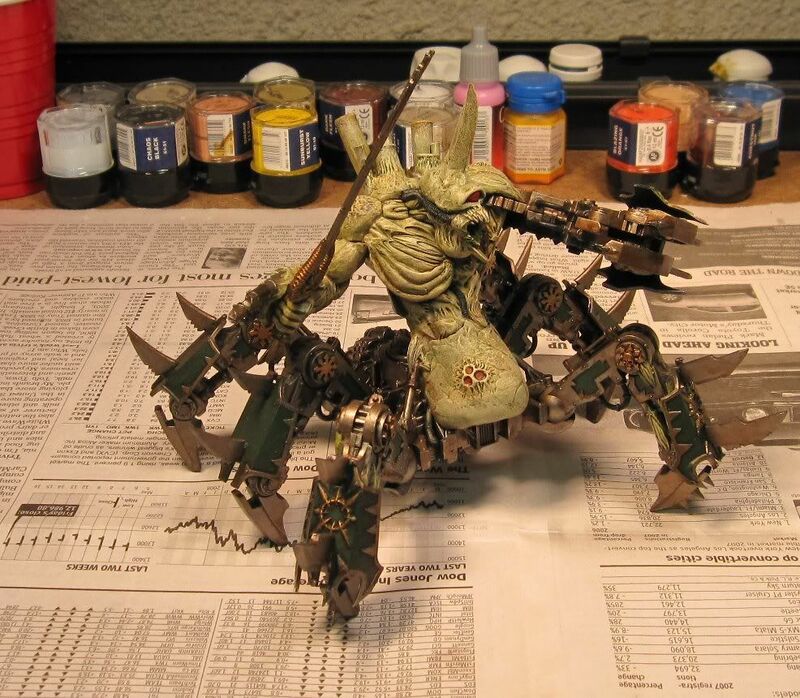 Below is a picture of the painted 500 pts. I had a lot of fun painting this army, and it is a pretty simple painting scheme. I primed all the models black, then base coated them with bubonic brown. 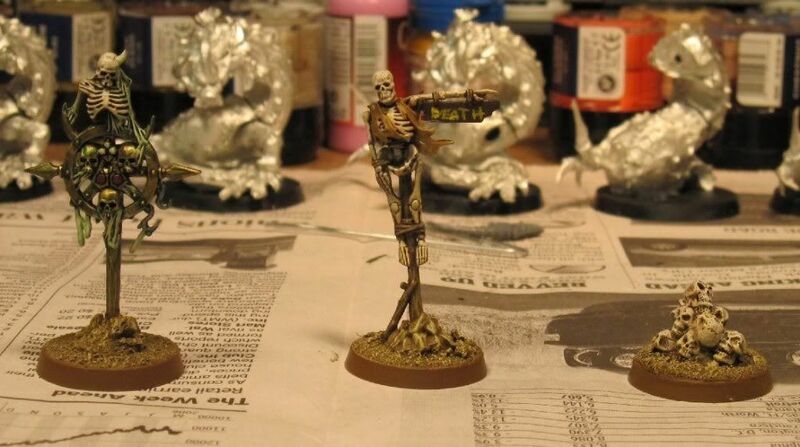 I gave them a wash with a thinned down green wash, and after that dried, I overbrushed them with more bubonic brown. Next, I washed then with a thinned down red wash. Finally, I overbrushed them with rotting flesh. Simple, but effective due to the color layers that show through. 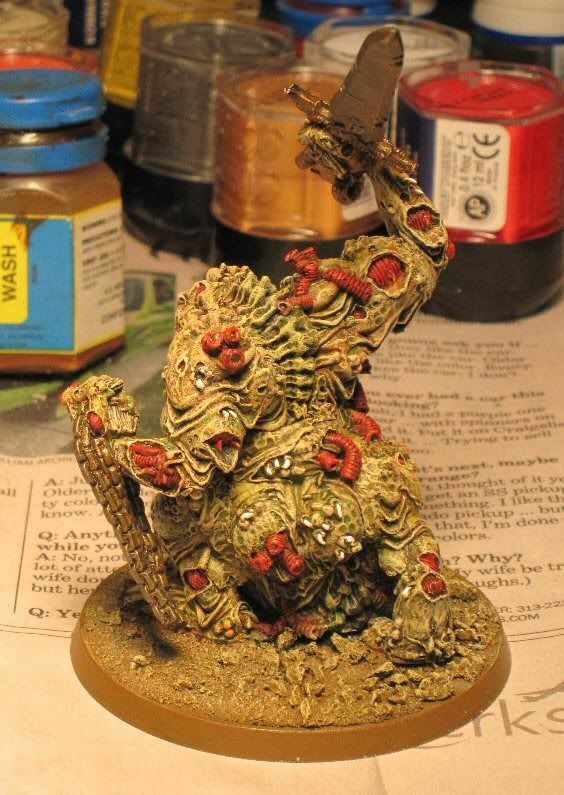 Here are close up pictures of the Great Unclean one. The battle we played with the first 500 points was a three-way Carnage battle, with three of the armies playing against each other. I lost the battle, I guess because I inspired the most fear. It did not help that my first 10-man plaguebearer squad that arrived on the table got assaulted by the entire 500 pts of Assault Blood Angels. Needless to say, they did not survive. 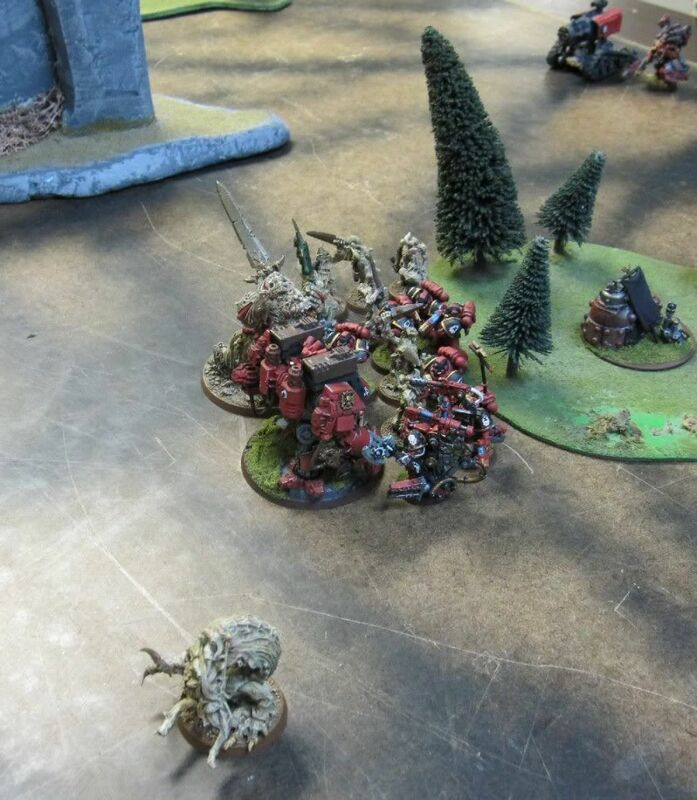 The second plaguebearer unit to arrive was assaulted by only some of the Blood Angels. The Great Clean one survived the battle as no one wanted to get close to him. It was a lot of fun. Even though I lost the battle, I did get voted best painted army. I am already done with the next portion of the ToFG which is an addition 350 points for the army, plus we had to do three army themed objectives. I will have to wait to post pictures of that.